Product #6313 | SKU KP-701E-01DB | 0.0 (no ratings yet) Thanks for your rating! Not all tablet pens are created equal. The Art Pen from Wacom replicates the feel and experience of a classical felt marker, but with all the advantages for working digitally in graphics applications, such as Adobe Photoshop or Corel Painter. 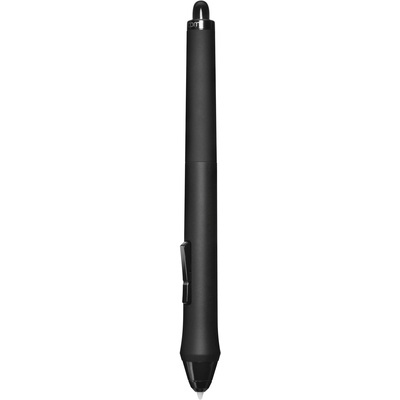 With a unique 360° rotation sensitivity, you can rotate the barrel of the pen and your Wacom tablet will recognise it. With this rotation sensitivity, you can use the included chisel nib tip to create unique paintbrush-like effects in Corel Painter or Adobe Photoshop. The chisel tip also allows you to emulate markers and calligraphic pens. Beyond barrel sensitivity, the pen features pressure and tilt sensitivities to provide you with even more capabilities. In any of the supported paint or photo programmes, these sensitivities come in handy when you need to adjust line weight, brush size, image opacity, or exposure. Moreover, you get a more fluid, natural feel when working. However, if you find that the pressure or tilt sensitivities aren't to your liking, you can easily customise either on your computer. As a nice added touch, an eraser crowns the top of the pen, so that you can digitally erase your work as you go along. In terms of accessories, you'll find two chisel-tipped nibs, two chisel-tipped felt nibs, three bullet-tipped nibs, three bullet-tipped felt nibs, and a convenient nib extractor for quickly switching out nibs. Also included is a pen stand that can hold the pen, some spare nibs, and the extractor.